Tabel Top Size - The mobile charger cube fits on top of most tables or registration counters. 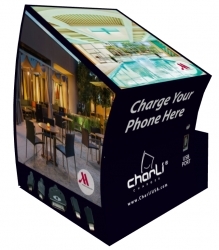 Advertising Features includes four-sided ad wrap – 7” wide X 10” high each side. Affrodable - Under $200, the Cube is an affordable solution to provide mobile charging services in multiple locations without busting the bank.